Dragonflygurl wrote: Ketana wrote: Dragonflygurl wrote: I made this keyring for my self. As you probably realise I love dragonflies, lol. The Emerald Clover is something I made recently and added to the top of my keyring. Man that was fiddle, I dropped it loads of times on the table and was saying oh deary me in not so many words. CheshireKat wrote: Dragonflygurl wrote: Ketana wrote: Dragonflygurl wrote: I made this keyring for my self. As you probably realise I love dragonflies, lol. The Emerald Clover is something I made recently and added to the top of my keyring. Man that was fiddle, I dropped it loads of times on the table and was saying oh deary me in not so many words. Well it's a surprise and you'll not necessarily get a keyring, it might be something else handmade. PAPA NOEL IS BRINGING ME SOMETHING NICE 'CAUSE I BEEN A GOOD GIRL THIS YEAR!! Oh, those are so VERY beautiful!!! I love them! Especially the blue one. Well done, DFG, really well done! Shenandora wrote: Oh, those are so VERY beautiful!!! I love them! Especially the blue one. My lay out and not from a kit. I'm trying all different colors and lay out's now. That's cute, looks like the one you sent me. Angel wrote: That's cute, looks like the one you sent me. 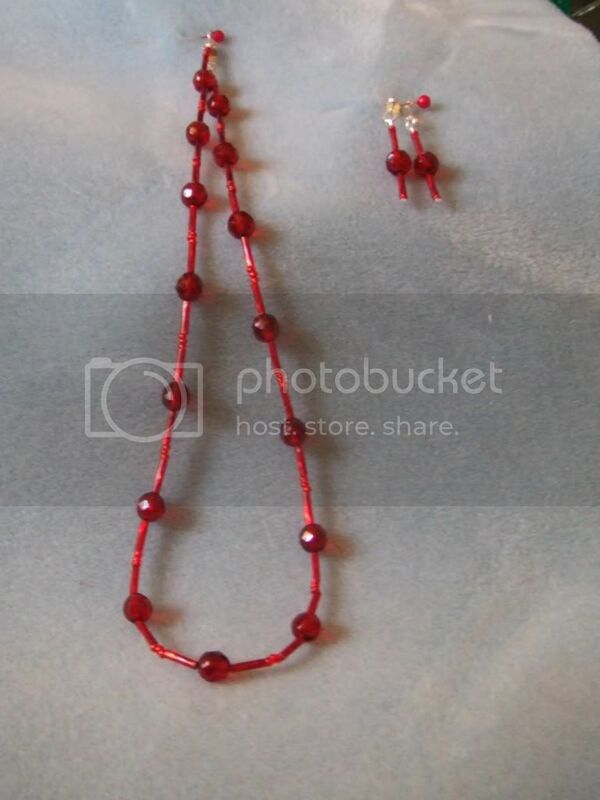 My niece wants a red necklace, so I made her this for xmas. It has match earrings which she asked for, but I still made them anyway. I just hope she likes it. Lovely red color, very festive for the holidays. At Angel's request I post these items I made today and yesterday evening. It's my first time I've made this sort of thing. Sorry my photo's are a bit crappy even though I took them with a digital camera, but I was sitting while taking them. Right I have all these boring plain plastic liquid soap dispencer's so I decided to decorate them. The first one I punch out all those butterflies, dragonflies, and leafs etc from sticky glitter paper. This is for my niece as I noticed so has just a bottle of bubble bath to wash your hands with, very messy. I just hope she likes it. I was too knacked to punch out any more stuff, so I cheated and used sticker's that were brought from a shop ages ago now, that was originally used for my handmade cards. It's empty this one. Those are really pretty, DFG. I especially love the candle decorated with the green charms.